Here are some of my favorite, commonly grown palm trees. Sago palms are not palms. In fact they belong to a different group of plants known as cycads. Cycads are plants that have changed a little in hundreds of thousands of years so they are also known as living fossils. Sago palms are native to southern Japan. They are commonly used as a landscape item. You can kill this plant by overwatering it. Allow the soil to dry before watering them again. Native to the Lord Howe Island of Australia, the kentia palm is a beautiful looking palm. Provide your kentia palms with indirect sunlight and water them regularly to see them thriving. Ponytail palm is a plant native to the deserts of Mexico. Like sago palm, this plant is also not a true palm. It is a succulent, which means it stores water, so overwatering can easily kill your ponytail palms. Place them under direct sunlight and water them sparingly. This palm bears delicious, edible fruit that is used in making jams and jellies. It is native to South America and is commonly known as the Jelly Palm and Wine Palm. Although they have a high drought tolerence but still you should water them regularly for proper growth and health. A lovely houseplant, native to the Amazon rainforests. The plant fives a delicate look and looks great both indoors and outdoors. Being native to the rainforests, they require regular watering. They grow as shrubs between the thick forests of Amazon, so place then under indirect sunlight as direct sunlight can damage them. They are excelent air cleaners so keeping a couple in your living room will be good for your health. A commonly grown plant throughout the world, the coconut palm bears fruit when it is 6 to 10 years of age. Normally, it will keep bearing fruit till it is 80 years old. Plant them in well drained, sandy soil, water regularly and make sure they get direct sunlight. Not suitable for colder climates. This medium-sized palm works as an excellent air purifier. They are native to the rainforests of Madagascar. They require a regular irrigation and would grow great in full sunlight. This palm tree is native to the Southeastern United States. Needle-like spines are produced on it and therefore they are also sometimes called the porcupine palms. 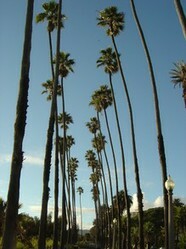 They are small palm trees reaching to a maximum height of 8 to 10 feet. They are very cold hardy and can tolerate cold down to 15 degrees Fahrenheit. They can also withstand droughts and floods. A few years ago, one tourism minister here in Romania planted some palm trees at the beach. They didn't like our coast too much . . . Does California get more water than we do here, I wonder? I do know that parts of California are in dire need of water, actually. I live in palm tree country and so I am pretty familiar with them. There are only certain varieties that I like. Some are difficult to care for...others much easier. My country [Sri-Lanka] is quite famous for palm trees and their exotic products! Nice to know more about them here.